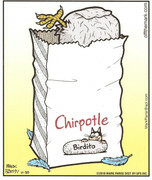 Did you know Off the Mark (newspaper panel comic strip) creator Mark Parasi is a fan of Wacky Packages? He helped with the recent 5th. 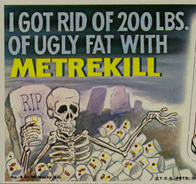 series of Wacky Packages Postcards. Mark did 3 weeks of Wacky Packages takes in his Off the Mark strip in 2007-2008. As always, thanks for the support. But it's "Parisi." "...I'll stop the world and melt with you..."
I love the fact that I can read "Off the Mark" every day off of Facebook. I enjoy it a lot. 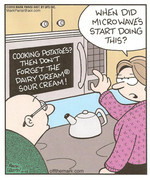 If you are on FB, you should become a fan of Mark's strip. 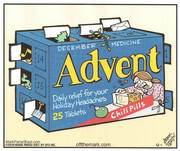 I get the Off The Mark strip in my daily Comics.com e-mail. Thanks for the love, guys! It looks like I'm going to have a few gags in the next ANS, too. I noticed in an April 2010 Off the Mark strip Mark's daughter did a strip as a guest artist in honor of "Take Your Daughter to Work Day'. I saw that too. I love being able to see Mark's new cartoons every day via Facebook. It is a great noon-time chuckle for me. One of my bosses, Cate, who is a gene-jockey (a plant breeding scientist) just returned from a vacation to Austrailia, and I spoke to her this afternoon. She told me there was a 18 month old child who cried the entire plane flight to Australia - so loud even earplugs didn't help much! Choose you eternity is a GREAT line, and this is a wonderful cartoon. I often wonder about eternity . . .
Satan looks a bit stoned - almost wackyish - as he should be. HEY! did you get his permission to use? You weren't copied on his PM? Mark is paying forum members $20 a post. He says it's cheaper than freeway billboards, airport hand-outs, and worldwide spam. As I have commented to Mark on his "Off The Mark" Facebook page, I'm loving this week's theme. Mark, those are great! 1 Muskateer is a riot! Simple yet very effective! The 1 Musketeer gag was never submitted to Topps since they won't use M&M-Mars gags, but I liked the idea so much I decided to draw it for myself. I even liked the other entries in the recent May 2010 Off the Mark Wacky Packages week besides 1 MUSKETTER: DAVE SOAP and BLITZ CRACKERS. This is a really great gag! I have to get on the Facebook list. Mark: Have to say I bought 6 sets of bio cards from Postcard Series 5 just to get your version of Wander Bread! Something about your work conveyed this perfect sense of wandering mischief in those slices of bread, and total exasperation on the part of the guy chasing them. Hilarious! One of my favorite Wackys. P.S. If I had to pick one of those eternities, I'd go with the hot dogs. I'd probably never eat again, but it'd be better than the screaming babies! I love that title too because it is almost exactly the gag I came up with years ago. I had even discussed possibly having David Saunders sketch and paint this for me, I just never followed through. Am I the only one that doesn't get the joke about 'no drafting'? Nope, I did not get it either. I have heard of the term drafting in racing before but perhaps the old brain is not working today, how does it associate to Mark's drawing assuming that's what Ducko meant? Because that's what he would be doing if they were going fast enough for it to make a difference. Mark's Off the Mark strip recently done this week for August 23-28, 2010 another Wacky Packages week! The best ones Mark did for this week are Riskies (August 23), Sticky Peanut Butter (August 24), Ghost It Note Pads (August 25), Thing Thongs (August 27), and NyKrill (August 28). Mark in his e-mail said Cornea (August 26) didn't make the cut for me. 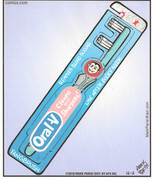 While Mark Parisi's Off the Mark strip is planning another Wacky Packages week for November 2010, here's a recent funny Off the Mark Sunday strip though not Wacky Packages related but relates to a funny idea for credit cards and scanning with 4 strips instead of 1? Maybe for Wacky Packages ANS8 in 2011 there could be a Wacky Packages credit card take (maybe a spoof of the DISCOVER credit card calling it "DISCOVERED" credit card) with the 4 magnetic scan strips on the credit card?? I have some accepted roughs from ANS7 to sell or trade. I also have some rejected roughs. Contact me if you might be interested. The ones from the week that didn't make the cut for me were the Snickers spoof (Slickers) and the Kleenex spoof (Grossnex). 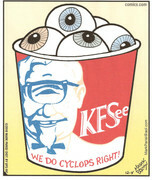 I hope Mark Parisi does a few more Off the Mark Wacky Packages week strips in 2011. 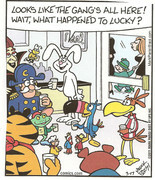 Did you notice this March 17, 2011 Off the Mark strip with many breakfast cereal mascots? The reason I bring it up, is I want to draw attention to an image I included in my banner. It's a baby sticking Wacky Packages everywhere. Looking for *Irish Test* cards! Glad to see Off the Mark moved from now gone Comics.com to gocomics.com - This is because Universal Uclick merged with United Feature Syndicate/United Media?